We started the quarter in the sands of the Middle East; we end it in the Big Easy. First published in September 17, 2013, The LaLaurie Horror is written in terza rima, and is 33 Cantos long. The structure tells us that the poem is based on Dante’s Inferno, which in turn was based on Virgil’s Aeneid and through it on Homer’s Iliad and Odyssey. The roots of this poem are deep indeed. 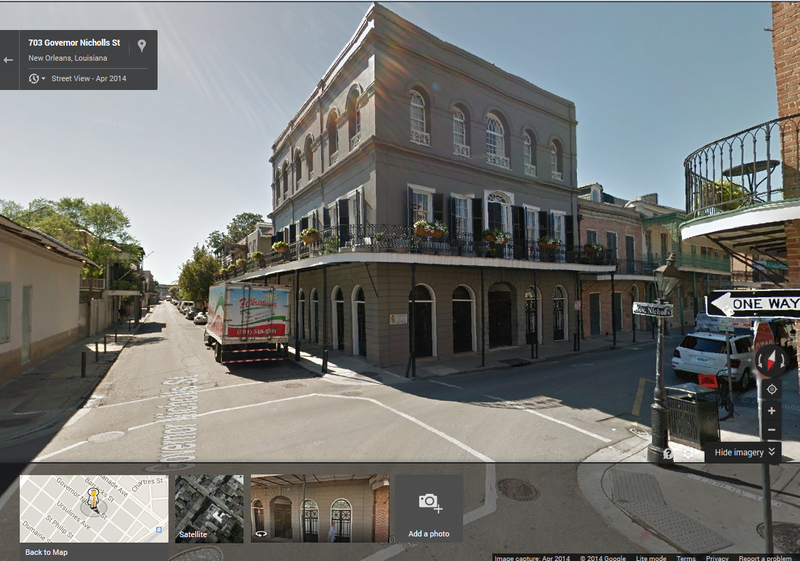 But this time the location isn’t lost in the mists of time: it’s at 1400 Royal Street in New Orleans. We can find it on Google Maps. And in principle, we can take a tour. But why? If you’ve read the background of the mansion, you know why. On April 10, 1834, people responding to a fire at the mansion found a house of horrors. Madame LaLaurie was subjecting many of her slaves to horrible tortures and death. She may well be the first serial killer in the United States. Given the central role of the use of torture as a way of enforcing slavery prior to the Civil War, Madame LaLaurie’s abuse must have been terrible indeed. So back to our tour. The unnamed speaker who tells the story is, like Dante before her, out of place and somewhat lost. She is a local quadroon who has somehow joined a group of tourists waiting to take a tour of the LaLaurie Mansion. So the evolution of the epic hero has taken another step; Evangeline was the first epic hero we’ve met who was a woman, and now we have an epic hero who is a woman of color, a descendent of both slave and slave-owner, she is ready to mediate between the past and present, and between the abused and the abuser. Unlike Dante, our hero is in danger of being pulled into the the hell she visits. As an African American, she would have been a potential target of Madame LaLaurie’s attacks at the time, just as she is a potential target of the ongoing legacy of slavery, Jim Crow, and prejudice and discrimination against both African Americans and women. Q. What interested you in telling this story? Q. Why did you write it in Cantos? A. After contemplation, the terza rima form seemed most appropriate and only natural. I had the idea of the tour guides leading my protagonist through the mansion, supernaturally. What more ideal venue, than what Dante employed for his “Inferno?” Also, I saw it as practice in wild territory. It was a form which I had not extensively explored nor mastered, so the ins and outs of its construction were as strange and weird and frightening to me as the unfolding plot. Q. Was your work consulted at all when they were making the American Horror Story episodes about Madame LaLaurie? A. As far as I know, Hollywood consulted none of us here who is knowledgeable on the subject. A friend of mine, the biographer and former Smithsonian Institute historian, Carolyn Morrow Long, was contacted by one of the show’s producers, though I don’t believe they ever followed up, on that contact. Kathy Bates’s accent coach claims to have seen a copy of Carolyn’s biography in Ms. Bates’s room on set, so I am guessing the writers, as well as the actors, relied solely on books for information and characterization, without any direct, personal interaction. Also, my book was published only weeks before the show aired. Previously, only a few cantos had appeared in print online. Even had they known about me, and read those scant cantos, those episodes had probably already been written and filmed, by the time my book hit the stores, and they heard about it. It was really an uncanny coincidence, the timing. Q. What inspired you to write the LaLaurie Horror? A. As I mentioned, my husband is not a native, but is from the North, and unfamiliar with much of our history and culture, though he has fallen irretrievably in love with Louisiana. Many years ago, on one of his first visits to New Orleans with me, we took a “ghost tour” of the French Quarter. The LaLaurie Mansion was one of the sights, where I was reminded of the story. Our tour guide was fantastic, and a large part of my inspiration. So, too, were the out-of-town tourists in the group. I saw their mesmerized faces, confronted by something so new, so “untold,” and realized I had not only a great opportunity, but also a tremendous responsibility. Q. Have you had a personal encounter with the supernatural or the unknown? A. No, I have not. I don’t see dead people, nor do I hear disembodied voices, nor have I ever experienced anything else that might be considered a part of the paranormal. I just have a very vivid imagination, and I have read extensively in the genre, from my earliest years. Q. What excited you the most about writing this type of novel? What did you find challenging? Q. Do you have a favorite stanza? If so, which one and why? A. I love this question, but it’s a bit like asking a mother to name her favorite child! I couldn’t pull out one lone stanza, to call my favorite — so I will tell you the two cantos which have the most powerful hold on my psyche. Those are cantos number 8 and 15. In Canto Eight, Madame introduces my protagonist to her “bevy of beauties,” her hurricane lamps, the most favored being Hurricane Lamp “Katrina.” Of course, you can probably guess at the reference here — the storm which might have destroyed New Orleans in 2005. I invested tremendous symbolism, in this lantern, and to a lesser extent, the other lanterns. It is more than a nod to the storm. These are tokens of desecration, as it were — the “anti-acolytes” of the story, indicators of the truly sinister in Madame. But this is also the canto which most sympathizes her, in my admittedly-subjective opinion. Here is where I tried to humanize her. The poet William Cullen Bryant met Madame Lalaurie, as she and her husband were fleeing the country aboard a ship out of New York. the Poland. He wrote of the encounter, that the women shunned Delphine, knowing her shame, and that he had seen her in tears over their rejection. So, through this account, we know that she had vulnerabilities. In Canto Eight, I feel that there is the most tension in her character, asking why she did not die, in one of those New Orleans hurricanes, before the events which ruined her reputation. Incidentally, all the information she provides is accurate, historically, regarding those hurricanes. The other canto which most affects me, in retrospect, is the fifteenth, where we meet the slave, John. All the names I have included for the slaves are the actual names of the slaves who remain unaccounted-for today. John really existed, as did Mary and all the others. Of course, I have fictionalized their tortures, as no one knows what fate befell them. But this particular canto, as we say in the South “tore me up.” I cried through the writing of this one. “John” is the name of my second-born son. There are tear stains on the pages of my hand-written first draft. Q. What fascinated you in your research of the Lalaurie case? Did find some similarities between her Lady Bathory? A. Basically, everything fascinated me. I am easily entertained. Interesting question, about Elizabeth Bathory. Countess Bathory was a fascination of mine as a child, when my father (who had a degree in criminal psychology) would tell me her story, and I first read about her through my Scholastic book orders. Yes, I do see similarities. Both were ladies of high social standing and wealth, women of privilege with powerful political relations. Both were sharp and savvy businesswomen, independent and capable, able to function well, without the help of husbands, something especially remarkable, in their times — hardly lunatics, in the eyes of the public. Both were mothers of numerous children. Both even, in fact, displayed compassion, in their interventions on certain occasions, on behalf of others — Bathory, in her defense of destitute women, Lalaurie, in an instance of slave-emancipation. Both initially preyed on servants. There are, as well, similarities in their chosen methods of torture. Neither was caught “red-handed,” in the act. They each had accomplices. After death, the bodily remains of both were moved from one resting place to another. In neither case do we have any indication of confession nor remorse, following their crimes. Q. How did you retrieve most of your information for the story; what types of information did you find or collect? A. My research was thorough, extensive, and — in a couple of cases — “exclusive.” I consulted the Vieux Carre Survey at the Historic New Orleans Collection, and got some information which is not generally known. I spent a good deal of time there at the mansion. I soaked in the atmosphere of the place, and even spoke to the household help and their relatives, employed by Michael Whalen, the Texan who currently owns the house. I pored over the writings of George Washington Cable, Lyle Saxon, Carolyn Morrow Long, the “field-guide,” Mad Madame Lalaurie, I viewed video-taped accounts by living “witnesses” to the hauntings — some going back decades ago. I went to the special collections library in Baton Rouge, for out-of-print sources on the subject, and re-read Tallant’s classic New Orleans “manual” on voodoo for specifics of that practice at the time. I also expanded my native knowledge on some of the ways in which voodoo is practiced now in the city. All kinds of information — topographical surveys, land transactions, weather records, etc. Q. If you were a slave in the Lalaurie household, what would be your worst fear, your escape plan, and how would you done to not be tortured by Delphine? A. I fear the most that I would somehow displease Madame, or that I would never be able to do anything good enough for her. Having observed the fates of two ruanaway slaves who were returned, and subsequently disappeared, honestly, I think I would have abandoned hope for escape. I probably would have focused on endearing myself to Madame, instead. After all, she did show favor, she had favorites, and even set one slave free. Some guests and visitors report that she lavished attention on certain slaves, even seeming to dote on them. I think my “escape plan” would be to follow Saint Paul’s advice from the Biblical New Testament book of Colossians: “Slaves, obey your earthly masters in everything; and do it, not only when their eye is on you and to curry their favor, but with sincerity of heart and reverence for the Lord.” And I would try to have faith for the rest, making God my route of escape. Q. Do most of your stories and novels take place in New Orleans or Louisiana in general? A. Yes. Not just “most,” but “all,” whenever place is mentioned. Q. What is it about the state that makes it different and more interesting than most? A. We have our own unique cuisines, Cajun and Creole, which have become famous throughout the world. My husband and I have written a memoir of our time in Paris. Some readers have complained that the book does not deal very much with the food there. But honestly — food was not a priority for us. After all, we live in a place where the routine cuisine is every bit as fine, and so we felt little compunction to hit the fancy restaurants! We have our own dialects, different from any other found in the U.S., or even in the South, at large. We have our own language in the Cajun tongue. Where else could you go in this world, and hear Elizabethan English spoken as a matter of course, among both small and great? Yet, that is the equivalent of what we have, in Cajun French here. In my humble opinion, our bayous are unrivaled in all the world, for mysterious, natural beauty. Our Napoleonic code of law, also, lends a different manner of living, a different world-view and outlook, setting us apart from the rest of the country. Also, I don’t believe, in all my travels, that I have ever visited more spiritual and soulful places, nor even read about them in books. We are a deeply, deeply spiritual state. Our political and administrative divisions bear the distinction of being called “parishes,” rather than counties, as is the case for the rest of the United States, and our “mother” country, England. And what was the name chosen as mascot for our sports franchise? The Saints. We have a melting pot which is unlike any other, in the mixture of Native American, Acadian, Haitian, African, Spanish, French, Italian and German immigrants who have made up the bulk of our history. We invent our own religions here. Hoodoo and Voodoo as practiced in the state are not exactly like what you will find in practice as Vodou in Haiti, or elsewhere. We invent our own music here. Jazz. Cajun. Zydeco. Swamp pop. Each year, we throw one of the biggest, most interesting parties on the planet — Mardi Gras. I have never known people more original, nor more likely to be “out of the box.” And I believe most would back me up, in that assessment. Once, I saw one of those cute emails and social media posts which make the rounds — you know the kind: “If your state were a person, what would that person’s image be?” Louisiana was something like, “The crazy cousin who can convince you to do things in the middle of the night that you know are going to totally baffle you in the morning.” It is deeper than simply this or that. It is a mindset — let’s do something different and interesting. Q. Writing a book in general is difficult. Was beginning writing in the poetic format, as you used in The LaLaurie Horror, daunting? A. Yes, you have hit on something big here. Getting started is the hardest part for me, always. I revel in endings, but beginnings, I dread. I may be sixty percent action, but I am forty percent procrastination. Without that crucial ten percent, I doubt I would ever do anything. Therefore, in retrospect, I feel like the opening is the most derivative section of the book, the least “Reeser” in its execution. Furthermore, this is something which had no precedent. There was nothing I could “crib” from, since the myth has never, ever been given this treatment, as far as I know. Like my protagonist, I was all alone, going into this “house.” Like her, I had to rely on “ghosts,” such as Dante. Q. Why did you choose not to provide your protagonist with a protective guide similar to Virgil in The Inferno? A. Please forgive me if this seems coquettish, shrinking-violet-like, or overly mystical — but no protective guide came forward. Inspiration is mysterious. There are many, many aspects of the book which I planned, and which have a conscious, decided meaning, some even with several layers. But an equal amount of the book has no explanation. Those portions remain as much a mystery to me as they are to you. I would have liked to have gotten Virgil, but neither Virgil nor anyone like him came willingly, and I was too lazy to go looking. Q. What was the most surprising fact that you uncovered as you researched for, and prepared to write, your epic? A. Without a doubt, it was the information that the Ursulines originally possessed the land where the mansion stands. France granted the property. They held it awhile, then sold it. I came across this while examining the Vieux Carre survey charts, courtesy of the Historic New Orleans Collection — a really obscure, arcane database of antiquated tables and deeds that I doubt anyone dredges. Although my memory may be at fault, I did not recall reading this fact in any of the literature, nor do I remember hearing it brought out, by guides on tours. Spoiler alert, if you haven’t reached the end of the story — but my jaw dropped at that. This is holy ground, blessed by the Church! The proverbial light bulb went off in my mind, and I had the surprising “twist” end to my poem. It changed everything, all previous perspective and context, like a bomb had detonated. Q. What was your writing process like when you wrote the piece? A. I did not write every day. Every two or three weeks, I would sit down, and spend several hours at one time, usually finishing an entire canto in one day, having brooded those two weeks over the story. I am a brooder by nature, and this process I have described is the habit formed over two decades of child-bearing and care. I have five children, and during my twenties and thirties, had to go for days or weeks sometimes before I could sit down and write. I learned to really think deeply over the important pieces, and I learned to hold phrases, lines or entire poems in my mind, for long periods of time. There were days when I was too mentally or physically exhausted simply to pick up a pencil, if I did get a break. Even when I did get a break, oftentimes, it would mean writing in the middle of the night, following an A.M. feeding, or rocking to sleep a baby with an ear infection. Q. After completing your work, is there anything you would change? A. No. I am fairly satisfied with what is there. The whole is amazingly “realized,” when measured on the scale of my intentions. Q. How long did it take to write The LaLaurie Horror? A. Just over a year. Two cantos, written twice a month, thirty-three cantos in all. Q. Are you considering working on another epic poem with roots in Louisiana? I have already begun work on a long poem, set here in southwest Louisiana, in Acadiana, rather than in New Orleans. It employs the same form which Goethe used for his poem, Die Braut von Korinth (The Bride of Corinth,) and is on a similar theme with Goethe’s. The writing is going much faster on this one, with more regularity. I work a bit on it each day. I am about three-thousand words into the writing, and it looks as though this might exceed Lalaurie Horror, in length. Q. Which character is your favorite? Q. If you had the chance, what is one thing you would say to Madame Lalaurie? A. She renders me dumb. Like my mute protagonist, I have nothing to say to her. Thanks so much for the great questions. I have enjoyed this. God bless you all.